Simppeli Apps provide a solution for small and middle-sized companies. Inside you will find Invoicing, Customers and Work Accumulator. Free version of the apps. Registering will only take 5 minutes! With Customers App none of your customers will be forgotten, here you can find all contact info easily and quickly. Customers-app also work with Invoices App and Work Accumulator, so you can see all the sent invoices and work for the specified customer. With Invoices App you can create invoices for your customers easily and quickly. The app also acts as an archive for all of invoices - no more piles of invoices on your desktop! The app also works together with Customers App (requiring that both apps are enabled) to make creating invoices an even easier task - you can just choose your customer from the list and the app will automatically fill the rest of the contact info. PDF-format or send it to your customers email. All of this you can do straight from Simppeli! With Work Accumulator all your work is saved. You can mark the work you have done and the customer the work has been done for. You can also use the integrated timer to keep track of your working time! Together with Invoices App invoicing for work is easier than before - you can choose the work you want to invoice and create an invoice from them, all with a couple of clicks! 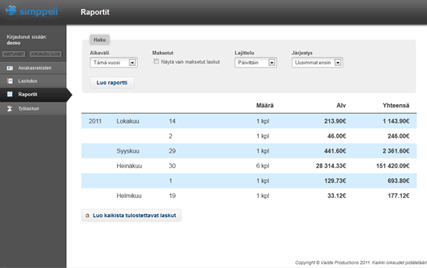 With Reports App you can create reports from all of your sent invoices. 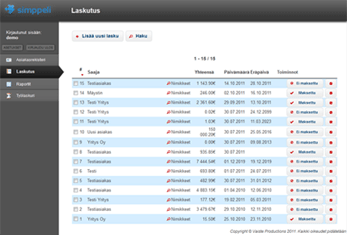 Do you want to quickly see all last year's invoices, sorted by month? Not to worry, this can be done with just a couple of clicks! You can filter the reports f.ex. by day, month or customer. You can save copies of the report's invoices in a handy ZIP-file.